Greece, officially the Hellenic Republic (Greek: Ελληνική Δημοκρατία), also known as Hellas (Greek: Ελλάς), is a country located in Southern and Southeast Europe, with a population of approximately 11 million as of 2016. Athens is the nation's capital and largest city, followed by Thessaloniki. Greece is located at the crossroads of Europe, Asia, and Africa. Situated on the southern tip of the Balkan Peninsula, it shares land borders with Albania to the northwest, North Macedonia and Bulgaria to the north, and Turkey to the northeast. The Aegean Sea lies to the east of the mainland, the Ionian Sea to the west, the Cretan Sea and the Mediterranean Sea to the south. 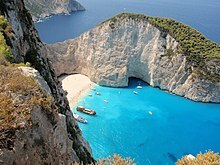 Greece has the longest coastline on the Mediterranean Basin and the 11th longest coastline in the world at 13,676 km (8,498 mi) in length, featuring a large number of islands, of which 227 are inhabited. Eighty percent of Greece is mountainous, with Mount Olympus being the highest peak at 2,918 metres (9,573 ft). The country consists of nine geographic regions: Macedonia, Central Greece, the Peloponnese, Thessaly, Epirus, the Aegean Islands (including the Dodecanese and Cyclades), Thrace, Crete, and the Ionian Islands. Greece is considered the cradle of Western civilisation, being the birthplace of democracy, Western philosophy, Western literature, historiography, political science, major scientific and mathematical principles, Western drama and notably the Olympic Games. From the eighth century BC, the Greeks were organised into various independent city-states, known as poleis (singular polis), which spanned the entire Mediterranean region and the Black Sea. Philip of Macedon united most of the Greek mainland in the fourth century BC, with his son Alexander the Great rapidly conquering much of the ancient world, from the eastern Mediterranean to India. 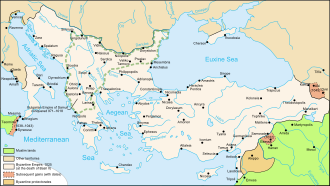 Greece was annexed by Rome in the second century BC, becoming an integral part of the Roman Empire and its successor, the Byzantine Empire, in which Greek language and culture were dominant. 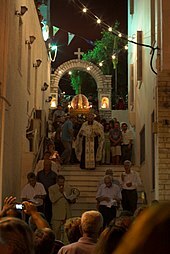 Rooted in the first century A.D., the Greek Orthodox Church helped shape modern Greek identity and transmitted Greek traditions to the wider Orthodox World. Falling under Ottoman dominion in the mid-15th century, the modern nation state of Greece emerged in 1830 following a war of independence. Greece's rich historical legacy is reflected by its 18 UNESCO World Heritage Sites. The sovereign state of Greece is a unitary parliamentary republic and developed country with an advanced high-income economy, a high quality of life, and a very high standard of living. A founding member of the United Nations, Greece was the tenth member to join the European Communities (precursor to the European Union) and has been part of the Eurozone since 2001. It is also a member of numerous other international institutions, including the Council of Europe, the North Atlantic Treaty Organization (NATO), the Organisation for Economic Co-operation and Development (OECD), the World Trade Organization (WTO), the Organization for Security and Co-operation in Europe (OSCE), and the Organisation internationale de la Francophonie (OIF). 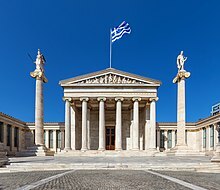 Greece's unique cultural heritage, large tourism industry, prominent shipping sector and geostrategic importance[a] classify it as a middle power. It is the largest economy in the Balkans, where it is an important regional investor. The names for the nation of Greece and the Greek people differ from the names used in other languages, locations and cultures. The Greek name of the country is Hellas (/ˈhɛləs/) or Ellada (Greek: Ελλάς or Ελλάδα; in polytonic: Ἑλλάς (Greek pronunciation: [eˈlas], Ancient Greek: [heˈlas]) or Ἑλλάδα Elláda Greek pronunciation: [eˈlaða]), and its official name is the Hellenic Republic (Greek: Ελληνική Δημοκρατία Ellinikí Dimokratía Greek pronunciation: [eliniˈci ðimokraˈti.a]). In English, however, the country is usually called Greece, which comes from Latin Graecia (as used by the Romans) and literally means 'the land of the Greeks'. 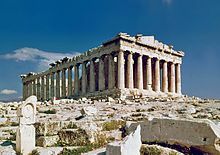 Greece is home to the first advanced civilizations in Europe and is considered the birthplace of Western civilisation,[b] beginning with the Cycladic civilization on the islands of the Aegean Sea at around 3200 BC, the Minoan civilization in Crete (2700–1500 BC), and then the Mycenaean civilization on the mainland (1600–1100 BC). These civilizations possessed writing, the Minoans writing in an undeciphered script known as Linear A, and the Mycenaeans in Linear B, an early form of Greek. The Mycenaeans gradually absorbed the Minoans, but collapsed violently around 1200 BC, during a time of regional upheaval known as the Bronze Age collapse. This ushered in a period known as the Greek Dark Ages, from which written records are absent. Though the unearthed Linear B texts are too fragmentary for the reconstruction of the political landscape and can't support the existence of a larger state contemporary Hittite and Egyptian records suggest the presence of a single state under a "Great King" based in mainland Greece. By 500 BC, the Persian Empire controlled the Greek city states in Asia Minor and Macedonia. Attempts by some of the Greek city-states of Asia Minor to overthrow Persian rule failed, and Persia invaded the states of mainland Greece in 492 BC, but was forced to withdraw after a defeat at the Battle of Marathon in 490 BC. In response, the Greek city-states formed the Hellenic League in 481 BC, led by Sparta, which was the first historically recorded union of Greek States since the mythical union of the Trojan War. A second invasion by the Persians followed in 480 BC. Following decisive Greek victories in 480 and 479 BC at Salamis, Plataea, and Mycale, the Persians were forced to withdraw for a second time, marking their eventual withdrawal from all of their European territories. Led by Athens and Sparta, the Greek victories in the Greco-Persian Wars are considered a pivotal moment in world history, as the 50 years of peace that followed are known as the Golden Age of Athens, the seminal period of ancient Greek development that laid many of the foundations of Western civilization. Lack of political unity within Greece resulted in frequent conflict between Greek states. The most devastating intra-Greek war was the Peloponnesian War (431–404 BC), won by Sparta and marking the demise of the Athenian Empire as the leading power in ancient Greece. Both Athens and Sparta were later overshadowed by Thebes and eventually Macedon, with the latter uniting most of the city-states of the Greek hinterland in the League of Corinth (also known as the Hellenic League or Greek League) under the control of Phillip II. Despite this development, the Greek world remained largely fragmented and would not be united under a single power until the Roman years. Sparta did not join the League and actively fought against it, raising an army led by Agis III to secure the city-states of Crete for Persia. Following the assassination of Phillip II, his son Alexander III ("The Great") assumed the leadership of the League of Corinth and launched an invasion of the Persian Empire with the combined forces of the League in 334 BC. 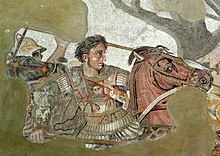 Undefeated in battle, Alexander had conquered the Persian Empire in its entirety by 330 BC. By the time of his death in 323 BC, he had created one of the largest empires in history, stretching from Greece to India. His empire split into several kingdoms upon his death, the most famous of which were the Seleucid Empire, Ptolemaic Egypt, the Greco-Bactrian Kingdom, and the Indo-Greek Kingdom. Many Greeks migrated to Alexandria, Antioch, Seleucia, and the many other new Hellenistic cities in Asia and Africa. Although the political unity of Alexander's empire could not be maintained, it resulted in the Hellenistic civilization and spread the Greek language and Greek culture in the territories conquered by Alexander. Greek science, technology, and mathematics are generally considered to have reached their peak during the Hellenistic period. 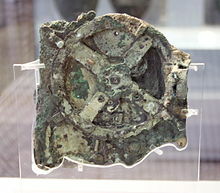 The Antikythera mechanism (c. 100 BC) is considered to be the first known mechanical analog computer ( National Archaeological Museum, Athens). The process was completed in 27 BC when the Roman Emperor Augustus annexed the rest of Greece and constituted it as the senatorial province of Achaea. Despite their military superiority, the Romans admired and became heavily influenced by the achievements of Greek culture, hence Horace's famous statement: Graecia capta ferum victorem cepit ("Greece, although captured, took its wild conqueror captive"). The epics of Homer inspired the Aeneid of Virgil, and authors such as Seneca the younger wrote using Greek styles. Roman heroes such as Scipio Africanus, tended to study philosophy and regarded Greek culture and science as an example to be followed. Similarly, most Roman emperors maintained an admiration for things Greek in nature. The Roman Emperor Nero visited Greece in AD 66, and performed at the Ancient Olympic Games, despite the rules against non-Greek participation. Hadrian was also particularly fond of the Greeks. Before becoming emperor, he served as an eponymous archon of Athens. Greek-speaking communities of the Hellenised East were instrumental in the spread of early Christianity in the 2nd and 3rd centuries, and Christianity's early leaders and writers (notably St Paul) were mostly Greek-speaking, though generally not from Greece itself. The New Testament was written in Greek, and some of its sections (Corinthians, Thessalonians, Philippians, Revelation of St. John of Patmos) attest to the importance of churches in Greece in early Christianity. Nevertheless, much of Greece clung tenaciously to paganism, and ancient Greek religious practices were still in vogue in the late 4th century AD, when they were outlawed by the Roman emperor Theodosius I in 391–392. The last recorded Olympic games were held in 393, and many temples were destroyed or damaged in the century that followed. In Athens and rural areas, paganism is attested well into the sixth century AD and even later. The closure of the Neoplatonic Academy of Athens by the Emperor Justinian in 529 is considered by many to mark the end of antiquity, although there is evidence that the Academy continued its activities for some time after that. 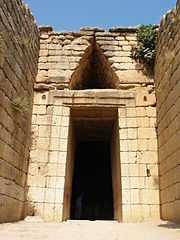 Some remote areas such as the southeastern Peloponnese remained pagan until well into the 10th century AD. From the 4th century, the Empire's Balkan territories, including Greece, suffered from the dislocation of barbarian invasions. The raids and devastation of the Goths and Huns in the 4th and 5th centuries and the Slavic invasion of Greece in the 7th century resulted in a dramatic collapse in imperial authority in the Greek peninsula. 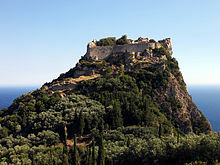 Following the Slavic invasion, the imperial government retained formal control of only the islands and coastal areas, particularly the densely populated walled cities such as Athens, Corinth and Thessalonica, while some mountainous areas in the interior held out on their own and continued to recognize imperial authority. Outside of these areas, a limited amount of Slavic settlement is generally thought to have occurred, although on a much smaller scale than previously thought. However, the view that Greece in late antiquity underwent a crisis of decline, fragmentation and depopulation is now considered outdated, as Greek cities show a high degree of institutional continuity and prosperity between the 4th and 6th centuries AD (and possibly later as well). In the early 6th century, Greece had approximately 80 cities according to the Synecdemus chronicle, and the period from the 4th to the 7th century AD is considered one of high prosperity not just in Greece but in the entire Eastern Mediterranean. Until the 8th century almost all of modern Greece was under the jurisdiction of the Holy See of Rome according to the system of Pentarchy. Byzantine Emperor Leo III moved the border of the Patriarchate of Constantinople westward and northward in the 8th century. Following the Fourth Crusade and the fall of Constantinople to the "Latins" in 1204 mainland Greece was split between the Greek Despotate of Epirus (a Byzantine successor state) and French rule (known as the Frankokratia), while some islands came under Venetian rule. The re-establishment of the Byzantine imperial capital in Constantinople in 1261 was accompanied by the empire's recovery of much of the Greek peninsula, although the Frankish Principality of Achaea in the Peloponnese and the rival Greek Despotate of Epirus in the north both remained important regional powers into the 14th century, while the islands remained largely under Genoese and Venetian control. During the Paleologi dynasty (1261–1453) a new era of Greek patriotism emerged accompanied by a turning back to ancient Greece. As such prominent personalities at the time also proposed changing the imperial title to "Emperor of the Hellenes", and, in late fourteenth century, the emperor was frequently referred to as the "Emperor of the Hellenes". Similarly, in several international treaties of that time the Byzantine emperor is styled as "Imperator Graecorum". 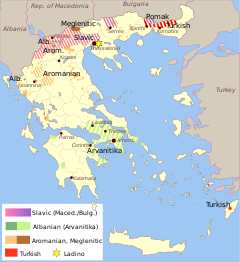 In the 14th century, much of the Greek peninsula was lost by the Byzantine Empire at first to the Serbs and then to the Ottomans. By the beginning of the 15th century, the Ottoman advance meant that Byzantine territory in Greece was limited mainly to its then-largest city, Thessaloniki, and the Peloponnese (Despotate of the Morea). After the fall of Constantinople to the Ottomans in 1453, the Morea was one of the last remnants of the Byzantine Empire to hold out against the Ottomans. However, this, too, fell to the Ottomans in 1460, completing the Ottoman conquest of mainland Greece. With the Turkish conquest, many Byzantine Greek scholars, who up until then were largely responsible for preserving Classical Greek knowledge, fled to the West, taking with them a large body of literature and thereby significantly contributing to the Renaissance. When military conflicts broke out between the Ottoman Empire and other states, Greeks usually took up arms against the Ottomans, with few exceptions. 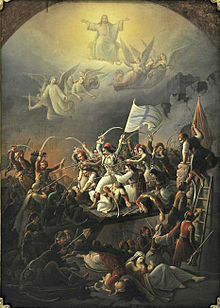 Prior to the Greek Revolution of 1821, there had been a number of wars which saw Greeks fight against the Ottomans, such as the Greek participation in the Battle of Lepanto in 1571, the Epirus peasants' revolts of 1600–1601 (led by the Orthodox bishop Dionysios Skylosophos), the Morean War of 1684–1699, and the Russian-instigated Orlov Revolt in 1770, which aimed at breaking up the Ottoman Empire in favor of Russian interests. [page needed] These uprisings were put down by the Ottomans with great bloodshed. On the other side, many Greeks were conscripted as Ottoman citizens to serve in the Ottoman army (and especially the Ottoman navy), while also the Ecumenical Patriarchate of Constantinople, responsible for the Orthodox, remained in general loyal to the empire. The sortie (exodus) of Messolonghi, depicting the Third Siege of Missolonghi, painted by Theodoros Vryzakis. The Battle of Navarino in 1827 secured Greek independence. By the end of the month, the Peloponnese was in open revolt against the Ottomans and by October 1821 the Greeks under Theodoros Kolokotronis had captured Tripolitsa. The Peloponnesian revolt was quickly followed by revolts in Crete, Macedonia and Central Greece, which would soon be suppressed. Meanwhile, the makeshift Greek navy was achieving success against the Ottoman navy in the Aegean Sea and prevented Ottoman reinforcements from arriving by sea. In 1822 and 1824 the Turks and Egyptians ravaged the islands, including Chios and Psara, committing wholesale massacres of the population. Approximately three-quarters of the Chios' Greek population of 120,000 were killed, enslaved or died of disease. This had the effect of galvanizing public opinion in western Europe in favor of the Greek rebels. After years of negotiation, three great powers, France, Russian Empire, and the United Kingdom, decided to intervene in the conflict and each nation sent a navy to Greece. Following news that combined Ottoman–Egyptian fleets were going to attack the Greek island of Hydra, the allied fleet intercepted the Ottoman–Egyptian fleet at Navarino. A week-long standoff ended with the Battle of Navarino which resulted in the destruction of the Ottoman–Egyptian fleet. 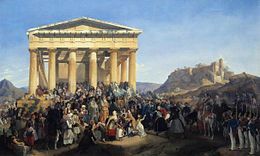 A French expeditionary force was dispatched to supervise the evacuation of the Egyptian army from the Peloponnese, while the Greeks proceeded to the captured part of Central Greece by 1828. As a result of years of negotiation, the nascent Greek state was finally recognised under the London Protocol in 1830. 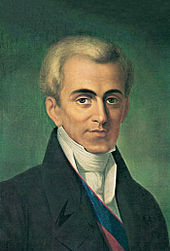 In 1827, Ioannis Kapodistrias, from Corfu, was chosen by the Third National Assembly at Troezen as the first governor of the First Hellenic Republic. Kapodistrias established a series of state, economic and military institutions. Soon tensions appeared between him and local interests. Following his assassination in 1831 and the subsequent London conference a year later, the Great Powers of Britain, France and Russia installed Bavarian Prince Otto von Wittelsbach as monarch. Otto's reign was despotic, and in its first 11 years of independence Greece was ruled by a Bavarian oligarchy led by Joseph Ludwig von Armansperg as Prime Minister and, later, by Otto himself, who held the title of both King and Premier. Throughout this period Greece remained under the influence of its three protecting Great Powers, France, Russia, and the United Kingdom, as well as Bavaria. In 1843 an uprising forced the king to grant a constitution and a representative assembly. Despite the absolutism of Otto's reign, the early years proved instrumental in creating institutions which are still the bedrock of Greek administration and education. Important steps were taken in the creation of the education system, maritime and postal communications, effective civil administration and, most importantly, the legal code. Historical revisionism took the form of de-Byzantinification and de-Ottomanisation, in favour of promoting the country's Ancient Greek heritage. In this spirit, the national capital was moved from Nafplio, where it had been since 1829, to Athens, which was at the time a village. Religious reform also took place, and the Church of Greece was established as Greece's national church, although Otto remained a Catholic. 25 March, the day of Annunciation, was chosen as the anniversary of the Greek War of Independence in order to reinforce the link between Greek identity and Orthodoxy. Pavlos Karolidis called the Bavarian efforts to create a modern state in Greece as "not only appropriate for the peoples' needs, but also based on excellent administrative principles of the era". Otto was deposed in the 23 October 1862 Revolution. Multiple causes led to his deposition and exile, including the Bavarian-dominated government, heavy taxation, and a failed attempt to annex Crete from the Ottoman Empire. The catalyst for the revolt was Otto's dismissal of Konstantinos Kanaris from the Premiership. A year later, he was replaced by Prince Wilhelm (William) of Denmark, who took the name George I and brought with him the Ionian Islands as a coronation gift from Britain. A new Constitution in 1864 changed Greece's form of government from constitutional monarchy to the more democratic crowned republic. In 1875 the concept of parliamentary majority as a requirement for the formation of a government was introduced by Charilaos Trikoupis, curbing the power of the monarchy to appoint minority governments of its preference. Corruption, coupled with Trikoupis' increased spending to fund infrastructure projects like the Corinth Canal, overtaxed the weak Greek economy and forced the declaration of public insolvency in 1893. Greece also accepted the imposition of an International Financial Control authority to pay off the country's debtors. Another political issue in 19th-century Greece was uniquely Greek: the language question. The Greek people spoke a form of Greek called Demotic. Many of the educated elite saw this as a peasant dialect and were determined to restore the glories of Ancient Greek. All Greeks were united, however, in their determination to liberate the Hellenic lands under Ottoman rule. Especially in Crete, a prolonged revolt in 1866–1869 had raised nationalist fervour. When war broke out between Russia and the Ottomans in 1877, Greek popular sentiment rallied to Russia's side, but Greece was too poor, and too concerned about British intervention, to officially enter the war. Nevertheless, in 1881, Thessaly and small parts of Epirus were ceded to Greece as part of the Treaty of Berlin, while frustrating Greek hopes of receiving Crete. Greeks in Crete continued to stage regular revolts, and in 1897, the Greek government under Theodoros Deligiannis, bowing to popular pressure, declared war on the Ottomans. In the ensuing Greco-Turkish War of 1897, the badly trained and equipped Greek army was defeated by the Ottomans. Through the intervention of the Great Powers, however, Greece lost only a little territory along the border to Turkey, while Crete was established as an autonomous state under Prince George of Greece. With state coffers empty, fiscal policy came under International Financial Control. Alarmed by the abortive Ilinden uprising of the autonomist IMRO in 1903, the Greek government, aiming to quell IMRO bands and detach the Slavophone peasants of the region from Bulgarian influence, sponsored a guerilla campaign in Ottoman-ruled Macedonia, led by Greek officers and known as the Macedonian Struggle, which ended with the Young Turk Revolution in 1908. Hellenic Army formation in the World War I Victory Parade in Arc de Triomphe, Paris, July 1919. Amidst general dissatisfaction with the seeming inertia and unattainability of national aspirations under the premiership of the cautious reformist Theotokis, a group of military officers organised a coup in August 1909 and shortly thereafter called to Athens Cretan politician Eleftherios Venizelos, who conveyed a vision of national regeneration. After winning two elections and becoming Prime Minister in 1910, Venizelos initiated wide-ranging fiscal, social, and constitutional reforms, reorganised the military, made Greece a member of the Balkan League, and led the country through the Balkan Wars. By 1913, Greece's territory and population had almost doubled, annexing Crete, Epirus, and Macedonia. In the following years, the struggle between King Constantine I and charismatic Venizelos over the country's foreign policy on the eve of First World War dominated the country's political scene, and divided the country into two opposing groups. During parts of the WW1, Greece had two governments: A royalist pro-German one in Athens and a Venizelist pro-Entente one in Thessaloniki. The two governments were united in 1917, when Greece officially entered the war on the side of the Entente. Map of Greater Greece after the Treaty of Sèvres, when the Megali Idea seemed close to fulfillment, featuring Eleftherios Venizelos as its supervising genius. In the aftermath of World War I, Greece attempted further expansion into Asia Minor, a region with a large native Greek population at the time, but was defeated in the Greco-Turkish War of 1919–1922, contributing to a massive flight of Asia Minor Greeks. These events overlapped, with both happening during the Greek genocide (1914–1922), a period during which, according to various sources, Ottoman and Turkish officials contributed to the death of several hundred thousand Asia Minor Greeks, along with similar numbers of Assyrians and a rather larger number of Armenians. The resultant Greek exodus from Asia Minor was made permanent, and expanded, in an official Population exchange between Greece and Turkey. The exchange was part of the terms of the Treaty of Lausanne which ended the war. The following era was marked by instability, as over 1.5 million propertyless Greek refugees from Turkey had to be integrated into Greek society. Cappadocian Greeks, Pontian Greeks, and non-Greek followers of Greek Orthodoxy were all subject to the exchange as well. Some of the refugees could not speak the language, and were from what had been unfamiliar environments to mainland Greeks, such as in the case of the Cappadocians and non-Greeks. The refugees also made a dramatic post-war population boost, as the number of refugees was more than a quarter of Greece's prior population. The Axis occupation of Greece. Blue indicates the Italian, red the German and green the Bulgarian. People in Athens celebrate the liberation from the Axis powers, October 1944. Postwar Greece would soon experience a civil war and political polarization. Although the post-war decades were characterised by social strife and widespread marginalisation of the left in political and social spheres, Greece nonetheless experienced rapid economic growth and recovery, propelled in part by the U.S.-administered Marshall Plan. In 1952, Greece joined NATO, reinforcing its membership in the Western Bloc of the Cold War. King Constantine II's dismissal of George Papandreou's centrist government in July 1965 prompted a prolonged period of political turbulence, which culminated in a coup d'état on 21 April 1967 by the Regime of the Colonels. Under the junta, civil rights were suspended, political repression was intensified, and human rights abuses, including state-sanctioned torture, were rampant. Economic growth remained rapid before plateauing in 1972. The brutal suppression of the Athens Polytechnic uprising on 17 November 1973 set in motion the events that caused the fall of the Papadopoulos regime, resulting in a counter-coup which overthrew Georgios Papadopoulos and established brigadier Dimitrios Ioannidis as the new junta strongman. On 20 July 1974, Turkey invaded the island of Cyprus in response to a Greek-backed Cypriot coup, triggering a political crisis in Greece that led to the regime's collapse and the restoration of democracy through Metapolitefsi. 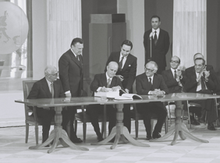 Signing at Zappeion by Constantine Karamanlis of the documents for the accession of Greece to the European Communities in 1979. Meanwhile, Andreas Papandreou, George Papandreou's son, founded the Panhellenic Socialist Movement (PASOK) in response to Karamanlis's conservative New Democracy party, with the two political formations dominating in government over the next four decades. Greece rejoined NATO in 1980. [c] Greece became the tenth member of the European Communities (subsequently subsumed by the European Union) on 1 January 1981, ushering in a period of sustained growth. Widespread investments in industrial enterprises and heavy infrastructure, as well as funds from the European Union and growing revenues from tourism, shipping, and a fast-growing service sector raised the country's standard of living to unprecedented levels. Traditionally strained relations with neighbouring Turkey improved when successive earthquakes hit both nations in 1999, leading to the lifting of the Greek veto against Turkey's bid for EU membership. The Pindus range continues through the central Peloponnese, crosses the islands of Kythera and Antikythera and finds its way into southwestern Aegean, in the island of Crete where it eventually ends. The islands of the Aegean are peaks of underwater mountains that once constituted an extension of the mainland. Pindus is characterised by its high, steep peaks, often dissected by numerous canyons and a variety of other karstic landscapes. The spectacular Vikos Gorge, part of the Vikos-Aoos National Park in the Pindus range, is listed by the Guinness book of World Records as the deepest gorge in the world. Another notable formation are the Meteora rock pillars, atop which have been built medieval Greek Orthodox monasteries. Greece features a vast number of islands - between 1,200 and 6,000, depending on the definition, 227 of which are inhabited - and is considered a non-contiguous transcontinental country. Crete is the largest and most populous island; Euboea, separated from the mainland by the 60m-wide Euripus Strait, is the second largest, followed by Lesbos and Rhodes. The building of the Hellenic Parliament ( Old Royal Palace) in central Athens. Legislative powers are exercised by a 300-member elective unicameral Parliament. Statutes passed by the Parliament are promulgated by the President of the Republic. Parliamentary elections are held every four years, but the President of the Republic is obliged to dissolve the Parliament earlier on the proposal of the Cabinet, in view of dealing with a national issue of exceptional importance. The President is also obliged to dissolve the Parliament earlier, if the opposition manages to pass a motion of no confidence. The voting age is 17. According to a 2016 report by the OECD, Greeks display a moderate level of civic participation compared to most other developed countries; voter turnout was 64 percent during recent elections, lower than the OECD average of 69 percent. Since the restoration of democracy, the Greek party system was dominated by the liberal-conservative New Democracy (ND) and the social-democratic Panhellenic Socialist Movement (PASOK). [e] Other significant parties include the Communist Party of Greece (KKE), the Coalition of the Radical Left (Syriza) the Popular Orthodox Rally (LAOS) and the Popular Association – Golden Dawn. Syriza has since overtaken PASOK as the main party of the centre-left . Alexis Tsipras led Syriza to victory in the general election held on 25 January 2015, falling short of an outright majority in Parliament by just two seats. The following morning, Tsipras reached an agreement with Independent Greeks party to form a coalition, and he was sworn in as Prime Minister of Greece. Tsipras called snap elections in August 2015, resigning from his post, which led to a month-long caretaker administration headed by judge Vassiliki Thanou-Christophilou, Greece's first female prime minister. In the September 2015 general election, Tsipras led Syriza to another victory, winning 145 out of 300 seats and re-forming the coalition with the Independent Greeks. Greece's foreign policy is conducted through the Ministry of Foreign Affairs and its head, the Minister for Foreign Affairs. The current minister is Alexis Tsipras. According to the official website, the main aims of the Ministry for Foreign Affairs are to represent Greece before other states and international organizations; safeguarding the interests of the Greek state and of its citizens abroad; the promotion of Greek culture; the fostering of closer relations with the Greek diaspora; and the promotion of international cooperation. 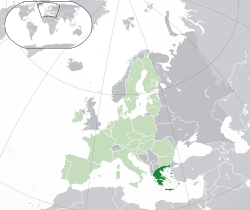 Additionally, due to its political and geographical proximity to Europe, Asia, the Middle East and Africa, Greece is a country of significant geostrategic importance and is considered to be a middle power and has developed a regional policy to help promote peace and stability in the Balkans, the Mediterranean, and the Middle East. The Ministry identifies two issues of particular importance to the Greek state: Turkish challenges to Greek sovereignty rights in the Aegean Sea and corresponding airspace; the Cyprus dispute and the Turkish occupation of Northern Cyprus. Greek military personnel total 367,450, of whom 142,950 are active and 220,500 are reserve. Greece ranks 15th in the world in the number of citizens serving in the armed forces, due largely to compulsory military service for males between the ages of 19 and 45 (females are exempted from conscription but may otherwise serve in the military). Mandatory military service is nine months for the Army and one year for the Navy and Air Force. Additionally, Greek males between the ages of 18 and 60 who live in strategically sensitive areas may be required to serve part-time in the National Guard. However, as the military has sought to become a completely professional force, the government has promised to reduce mandatory military service or abolish it completely. As a member of NATO, the Greek military participates in exercises and deployments under the auspices of the alliance, although its involvement in NATO missions is minimal. Greece spends over US$7 billion annually on its military, or 2.3 percent of GDP, the 24th-highest in the world in absolute terms, the seventh-highest on a per capita basis, and the second-highest in NATO after the United States. Moreover, Greece is one of only five NATO countries to meet or surpass the minimum defence spending target of 2 percent of GDP. 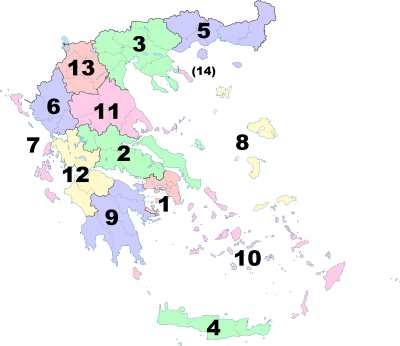 Since the Kallikratis programme reform entered into effect on 1 January 2011, Greece has consisted of thirteen regions subdivided into a total of 325 municipalities. The 54 old prefectures and prefecture-level administrations have been largely retained as sub-units of the regions. Seven decentralised administrations group one to three regions for administrative purposes on a regional basis. There is also one autonomous area, Mount Athos (Greek: Agio Oros, "Holy Mountain"), which borders the region of Central Macedonia. According to World Bank statistics for the year 2013, the economy of Greece is the 43rd largest by nominal gross domestic product at $242 billion and 52nd largest by purchasing power parity (PPP) at $284 billion. Additionally, Greece is the 15th largest economy in the 27-member European Union. In terms of per capita income, Greece is ranked 38th or 40th in the world at $21,910 and $25,705 for nominal GDP and PPP respectively. The Greek economy is classified as advanced and high-income. Greece is a developed country with a high standard of living and a high ranking in the Human Development Index. Its economy mainly comprises the service sector (85.0%) and industry (12.0%), while agriculture makes up 3.0% of the national economic output. Important Greek industries include tourism (with 14.9 million international tourists in 2009, it is ranked as the 7th most visited country in the European Union and 16th in the world by the United Nations World Tourism Organization) and merchant shipping (at 16.2% of the world's total capacity, the Greek merchant marine is the largest in the world), while the country is also a considerable agricultural producer (including fisheries) within the union. Greek unemployment stood at 21.7% in April 2017. The youth unemployment rate (42.3% in March 2018) is extremely high compared to EU standards. With an economy larger than all the other Balkan economies combined, Greece is the largest economy in the Balkans, and an important regional investor. Greece is the number-two foreign investor of capital in Albania, the number-three foreign investor in Bulgaria, at the top-three of foreign investors in Romania and Serbia and the most important trading partner and largest foreign investor of the Republic of Macedonia. Greek banks open a new branch somewhere in the Balkans on an almost weekly basis. The Greek telecommunications company OTE has become a strong investor in Yugoslavia and other Balkan countries. Greece was a founding member of the Organisation for Economic Co-operation and Development (OECD) and the Organization of the Black Sea Economic Cooperation (BSEC). In 1979 the accession of the country in the European Communities and the single market was signed, and the process was completed in 1982. Greece was accepted into the Economic and Monetary Union of the European Union on 19 June 2000, and in January 2001 adopted the Euro as its currency, replacing the Greek drachma at an exchange rate of 340.75 drachma to the Euro. Greece is also a member of the International Monetary Fund and the World Trade Organization, and is ranked 24th on the KOF Globalization Index for 2013. By late 2009, as a result of a combination of international and local factors, the Greek economy (which had fared well for much of the 20th century, with high growth rates and low public debt) faced its most-severe crisis since the restoration of democracy in 1974 when the Greek government revised its deficit from an estimated 6% to 12.7% of GDP. In the years before the crisis Goldman Sachs, JPMorgan Chase, and numerous other banks had developed financial products which enabled the governments of Greece, Italy, and many other European countries to hide their borrowing. Dozens of similar agreements were concluded across Europe whereby banks supplied cash in advance in exchange for future payments by the governments involved; in turn, the liabilities of the involved countries were "kept off the books". These conditions had enabled Greece as well as other European governments to spend beyond their means, while meeting the deficit targets set out in the Maastricht Treaty. In May 2010, the Greece's deficit was again revised and estimated to be 13.6% which was the second highest in the world relative to GDP, with Iceland in first place at 15.7% and the United Kingdom in third with 12.6%. 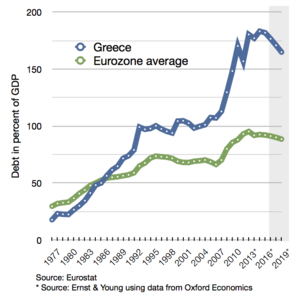 Public debt was forecast, according to some estimates, to hit 120% of GDP in the same year, causing a crisis of confidence in Greece's ability pay back loans. To avert a sovereign default, Greece, the other Eurozone members, and the International Monetary Fund agreed on a rescue package which involved giving Greece an immediate €45 billion in loans, with additional funds to follow, totaling €110 billion. To secure the funding, Greece was required to adopt harsh austerity measures to bring its deficit under control. A second bail-out amounting to €130 billion ($173 billion) was agreed in 2012, subject to strict conditions, including financial reforms and further austerity measures. A debt haircut was also agreed as part of the deal. Greece achieved a primary government budget surplus in 2013, while in April 2014, it returned to the global bond market. Greece returned to growth after six years of economic decline in the second quarter of 2014, and was the Eurozone's fastest-growing economy in the third quarter. A third bailout was agreed in July 2015, after a confrontation with the newly-elected government of Alexis Tsipras. There was a 25% drop in Greece's GDP, connected with the bailout programmes. This had a critical effect: the Debt-to-GDP ratio, the key factor defining the severity of the crisis, would jump from its 2009 level of 127% to about 170%, solely due to the shrinking economy. In a 2013 report, the IMF admitted that it had underestimated the effects of so extensive tax hikes and budget cuts on the country's GDP and issued an informal apology. The Greek programmes imposed a very rapid improvement in structural primary balance (at least two times faster than for other Eurozone bailed-out countries ). The policies have been blamed for worsening the crisis, while Greece's President, Prokopis Pavlopoulos, stressed the creditors' share in responsibility for the depth of the crisis. 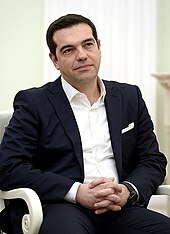 Greek Prime Minister, Alexis Tsipras, asserted that errors in the design of the first two programmes which lead to a loss of 25% of the Greek economy due to the harsh imposition of excessive austerity. Between 2009 and 2017 the Greek government debt rose from €300 bn to €318 bn, i.e. by only about 6% (thanks, in part, to the 2012 debt restructuring); however, during the same period, the critical debt-to-GDP ratio shot up from 127% to 179% basically due to the severe GDP drop during the handling of the crisis. Greece's bailouts successfully ended (as declared) on August 20, 2018. Electricity production in Greece is dominated by the state-owned Public Power Corporation (known mostly by its acronym ΔΕΗ, or in English DEI). In 2009 DEI supplied for 85.6% of all electric energy demand in Greece, while the number fell to 77.3% in 2010. Almost half (48%) of DEI's power output is generated using lignite, a drop from the 51.6% in 2009. The shipping industry has been a key element of Greek economic activity since ancient times. Shipping remains one of the country's most important industries, accounting for 4.5 percent of GDP, employing about 160,000 people (4 percent of the workforce), and representing a third of the trade deficit. According to a 2011 report by the United Nations Conference on Trade and Development, the Greek Merchant Navy is the largest in the world at 16.2 percent of total global capacity, up from 15.96 percent in 2010 but below the peak of 18.2 percent in 2006. The country's merchant fleet ranks first in total tonnage (202 million dwt), fourth in total number of ships (at 3,150), first in both tankers and dry bulk carriers, fourth in the number of containers, and fifth in other ships. However, today's fleet roster is smaller than an all-time high of 5,000 ships in the late 1970s. Additionally, the total number of ships flying a Greek flag (includes non-Greek fleets) is 1,517, or 5.3 percent of the world's dwt (ranked fifth globally). Greece has a significant shipbuilding and ship maintenance industry. The six shipyards around the port of Piraeus are among the largest in Europe. In recent years, Greece has also become a leader in the construction and maintenance of luxury yachts. Tourism has been a key element of the economic activity in the country and one of the country's most important sectors, contributing 20.6% of the gross domestic product as of 2018. Greece welcomed over 28 million visitors in 2016, which is an increase from the 26.5 million tourists it welcomed in 2015 and the 19.5 million in 2009, and the 17.7 million tourists in 2007, making Greece one of the most visited countries in Europe in the recent years. In 2010, Lonely Planet ranked Greece's northern and second-largest city of Thessaloniki as the world's fifth-best party town worldwide, comparable to other cities such as Dubai and Montreal. In 2011, Santorini was voted as "The World's Best Island" in Travel + Leisure. Its neighboring island Mykonos, came in fifth in the European category. There are 18 UNESCO World Heritage Sites in Greece, and Greece is ranked 16th in the world in terms of total sites. 14 further sites are on the tentative list, awaiting nomination. 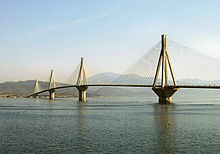 The Rio–Antirrio bridge connects mainland Greece to the Peloponnese. Since the 1980s, the road and rail network of Greece has been significantly modernised. Important works include the A2 (Egnatia Odos) motorway, that connects northwestern Greece (Igoumenitsa) with northern Greece (Thessaloniki) and northeastern Greece (Kipoi); the Rio–Antirrio bridge, the longest suspension cable bridge in Europe (2,250 m (7,382 ft) long), connecting the Peloponnese (Rio, 7 km (4 mi) from Patras) with Aetolia-Akarnania (Antirrio) in western Greece. The General Secretariat for Research and Technology of the Ministry of Development and Competitiveness is responsible for designing, implementing and supervising national research and technological policy. In 2003, public spending on research and development (R&D) was 456.37 million euros, a 12.6% increase from 2002. Total R&D spending (both public and private) as a percentage of GDP has more than doubled since 1989, from 0.38 percent to 0.83 percent as of 2014[update]. Although R&D spending in Greece remains lower than the EU average of 1.93 percent, between 1990 and 1998, total R&D expenditure in Greece enjoyed the third-highest increase in Europe, after Finland and Ireland. Because of its strategic location, qualified workforce, and political and economic stability, many multinational companies such as Ericsson, Siemens, Motorola, Coca-Cola, and Tesla have their regional research and development headquarters in Greece. 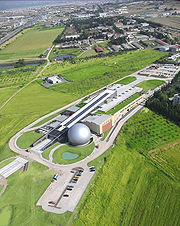 Greece has several major technology parks with incubator facilities and has been a member of the European Space Agency (ESA) since 2005. Cooperation between ESA and the Hellenic National Space Committee began in the early 1990s. In 1994, Greece and ESA signed their first cooperation agreement. Having formally applied for full membership in 2003, Greece became the ESA's sixteenth member on 16 March 2005. Greece participates in the ESA's telecommunication and technology activities, and the Global Monitoring for Environment and Security Initiative. Greece has one of the highest rates of tertiary enrollment in the world, while Greeks are well represented in academia worldwide; many leading Western universities employ a disproportionately high number of Greek faculty. 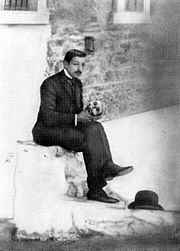 Notable Greek scientists of modern times include Georgios Papanikolaou (inventor of the Pap test), mathematician Constantin Carathéodory (known for the Carathéodory theorems and Carathéodory conjecture), astronomer E. M. Antoniadi, archaeologists Ioannis Svoronos, Valerios Stais, Spyridon Marinatos, Manolis Andronikos (discovered the tomb of Philip II of Macedon in Vergina), Indologist Dimitrios Galanos, botanist Theodoros G. Orphanides, such as Michael Dertouzos, Nicholas Negroponte, John Argyris, John Iliopoulos (2007 Dirac Prize for his contributions on the physics of the charm quark, a major contribution to the birth of the Standard Model, the modern theory of Elementary Particles), Joseph Sifakis (2007 Turing Award, the "Nobel Prize" of Computer Science), Christos Papadimitriou (2002 Knuth Prize, 2012 Gödel Prize), Mihalis Yannakakis (2005 Knuth Prize) and physicist Dimitri Nanopoulos. Hermoupolis, on the island of Syros, is the capital of the Cyclades. Greek society has changed rapidly over the last several decades, coinciding with the wider European trend of declining fertility and rapid aging. The fertility rate of 1.41 is below replacement levels and is one of the lowest in the world, subsequently leading to an increase in the median age to 44.2 years, the seventh-highest in the world. In 2001, 16.71 percent of the population were 65 years old and older, 68.12 percent between the ages of 15 and 64 years old, and 15.18 percent were 14 years old and younger. By 2016, the proportion of the population age 65 and older had risen to 20.68 percent, while the proportion of those aged 14 and younger declined to slightly below 14 percent. Almost two-thirds of the Greek people live in urban areas. Greece's largest and most influential metropolitan centres are those of Athens and Thessaloniki, which is commonly referred to in Greek as the "συμπρωτεύουσα" (lit. "co-capital"), with metropolitan populations of approximately 4 million and 1 million inhabitants respectively. Other prominent cities with urban populations above 100,000 inhabitants include those of Patras, Heraklion, Larissa, Volos, Rhodes, Ioannina, Agrinio, Chania, and Chalcis. Estimates of the recognised Greek Muslim minority, which is mostly located in Thrace, range around 100,000, (about 1% of the population). Some of the Albanian immigrants to Greece come from a nominally Muslim background, although most are secular in orientation. Following the 1919–1922 Greco-Turkish War and the 1923 Treaty of Lausanne, Greece and Turkey agreed to a population transfer based on cultural and religious identity. About 500,000 Muslims from Greece, predominantly those defined as Turks, but also Greek Muslims like the Vallahades of western Macedonia, were exchanged with approximately 1,500,000 Greeks from Turkey. However, many refugees who settled in former Ottoman Muslim villages in Central Macedonia and were defined as Christian Orthodox Caucasus Greeks arrived from the former Russian Transcaucasus province of Kars Oblast after it had been retroceded to Turkey but in the few years before the official population exchange. Since 2017, Hellenic Polytheism, or Helenism has been legally recognised as an actively practiced religion in Greece, with estimates of 2,000 active practitioners and an additional 100,000 "sympathisers". Hellenism refers to various religious movements that continue, revive or reconstruct ancient Greek religious practices. A map of the fifty countries with the largest Greek diaspora communities. 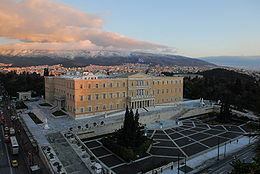 The Academy of Athens is Greece's national academy and the highest research establishment in the country. The Ionian Academy in Corfu, the first academic institution of modern Greece. Greeks have a long tradition of valuing and investing in paideia (education), which was upheld as one of the highest societal values in the Greek and Hellenistic world. The first European institution described as a university was founded in fifth-century Constantinople and continued operating in various incarnations until the city's fall to the Ottomans in 1453. The University of Constantinople was Christian Europe's first secular institution of higher learning, and by some measures was the world's first university. Compulsory education in Greece comprises primary schools (Δημοτικό Σχολείο, Dimotikó Scholeio) and gymnasium (Γυμνάσιο). Nursery schools (Παιδικός σταθμός, Paidikós Stathmós) are popular but not compulsory. Kindergartens (Νηπιαγωγείο, Nipiagogeío) are now compulsory for any child above four years of age. Children start primary school aged six and remain there for six years. Attendance at gymnasia starts at age 12 and lasts for three years. The Greek education system also provides special kindergartens, primary, and secondary schools for people with special needs or difficulties in learning. There are also specialist gymnasia and high schools offering musical, theological, and physical education. Seventy-two percent of Greek adults aged 25–64 have completed upper secondary education, which is slightly less than the OECD average of 74 percent. The average Greek pupil scored 458 in reading literacy, maths and science in the OECD's 2015 Programme for International Student Assessment (PISA). This score is lower than the OECD average of 486. On average, girls outperformed boys by 15 points, much more than the average OECD gap of two points. 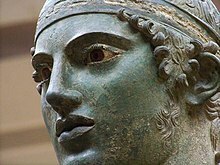 Close-up of the Charioteer of Delphi, a celebrated statue from the 5th century BC. There were several interconnected traditions of painting in ancient Greece. Due to their technical differences, they underwent somewhat differentiated developments. Not all painting techniques are equally well represented in the archaeological record. The most respected form of art, according to authors like Pliny or Pausanias, were individual, mobile paintings on wooden boards, technically described as panel paintings. Also, the tradition of wall painting in Greece goes back at least to the Minoan and Mycenaean Bronze Age, with the lavish fresco decoration of sites like Knossos, Tiryns and Mycenae. Much of the figural or architectural sculpture of ancient Greece was painted colourfully. This aspect of Greek stonework is described as polychrome. Ancient Greek sculpture was composed almost entirely of marble or bronze; with cast bronze becoming the favoured medium for major works by the early 5th century. Both marble and bronze are easy to form and very durable. Chryselephantine sculptures, used for temple cult images and luxury works, used gold, most often in leaf form and ivory for all or parts (faces and hands) of the figure, and probably gems and other materials, but were much less common, and only fragments have survived. By the early 19th century, the systematic excavation of ancient Greek sites had brought forth a plethora of sculptures with traces of notably multicolored surfaces. It was not until published findings by German archaeologist Vinzenz Brinkmann in the late 20th century, that the painting of ancient Greek sculptures became an established fact. Post Byzantine art schools include the Cretan School and Heptanese School. The first artistic movement in the Greek Kingdom can be considered the Greek academic art of the 19th century (Munich School). 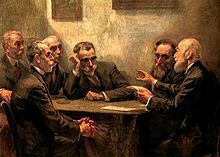 Notable modern Greek painters include Nikolaos Gyzis, Georgios Jakobides, Theodoros Vryzakis, Nikiforos Lytras, Konstantinos Volanakis, Nikos Engonopoulos and Yannis Tsarouchis, while some notable sculptors are Pavlos Prosalentis, Ioannis Kossos, Leonidas Drosis, Georgios Bonanos and Yannoulis Chalepas. Two special genres can be considered the Cycladic architecture, featuring white-coloured houses, in the Cyclades and the Epirotic architecture in the region of Epirus. After the establishment of the Greek Kingdom, the architecture of Athens and other cities was mostly influenced by the Neoclassical architecture. For Athens, the first King of Greece, Otto of Greece, commissioned the architects Stamatios Kleanthis and Eduard Schaubert to design a modern city plan fit for the capital of a state. As for Thessaloniki, after the fire of 1917, the government ordered for a new city plan under the supervision of Ernest Hébrard. Other modern Greek architects include Anastasios Metaxas, Panagis Kalkos, Ernst Ziller, Dimitris Pikionis and Georges Candilis. Nobile Teatro di San Giacomo di Corfù, the first theatre and opera house of modern Greece. The National Theatre of Greece was opened in 1900 as Royal Theatre. Notable playwrights of the modern Greek theatre include Gregorios Xenopoulos, Nikos Kazantzakis, Pantelis Horn, Alekos Sakellarios and Iakovos Kambanelis, while notable actors include Cybele Andrianou, Marika Kotopouli, Aimilios Veakis, Orestis Makris, Katina Paxinou, Manos Katrakis and Dimitris Horn. Significant directors include Dimitris Rontiris, Alexis Minotis and Karolos Koun. Athens is considered the birthplace of Western literature. At the beginning of Greek literature stand the two monumental works of Homer: the Iliad and the Odyssey. Though dates of composition vary, these works were fixed around 800 BC or after. In the classical period many of the genres of western literature became more prominent. Lyrical poetry, odes, pastorals, elegies, epigrams; dramatic presentations of comedy and tragedy; historiography, rhetorical treatises, philosophical dialectics, and philosophical treatises all arose in this period. The two major lyrical poets were Sappho and Pindar. The Classical era also saw the dawn of drama. Byzantine literature refers to literature of the Byzantine Empire written in Atticizing, Medieval and early Modern Greek, and it is the expression of the intellectual life of the Byzantine Greeks during the Christian Middle Ages. Although popular Byzantine literature and early Modern Greek literature both began in the 11th century, the two are indistinguishable. Constantine P. Cavafy, whose work was inspired mainly by the Hellenistic past, while Odysseas Elytis (centre) and Giorgos Seferis (right) were representatives of the Generation of the '30s and Nobel laureates in Literature. Statue of Plato in Athens. 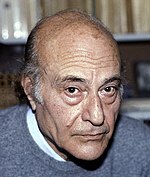 Other modern era Greek philosophers or political scientists include Cornelius Castoriadis, Nicos Poulantzas and Christos Yannaras. Rebetes in Karaiskaki, Piraeus (1933). Left Markos Vamvakaris with bouzouki. Greek cuisine is characteristic of the healthy Mediterranean diet, which is epitomised by dishes of Crete. Greek cuisine incorporates fresh ingredients into a variety of local dishes such as moussaka, pastitsio, classic Greek salad, fasolada, spanakopita and souvlaki. Some dishes can be traced back to ancient Greece like skordalia (a thick purée of walnuts, almonds, crushed garlic and olive oil), lentil soup, retsina (white or rosé wine sealed with pine resin) and pasteli (candy bar with sesame seeds baked with honey). Throughout Greece people often enjoy eating from small dishes such as meze with various dips such as tzatziki, grilled octopus and small fish, feta cheese, dolmades (rice, currants and pine kernels wrapped in vine leaves), various pulses, olives and cheese. Olive oil is added to almost every dish. Spyridon Louis entering the Panathenaic Stadium at the end of the marathon; 1896 Summer Olympics. 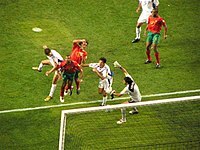 The Greek national football team, ranking 12th in the world in 2014 (and having reached a high of 8th in the world in 2008 and 2011), were crowned European Champions in Euro 2004 in one of the biggest upsets in the history of the sport. The Greek Super League is the highest professional football league in the country, comprising sixteen teams. 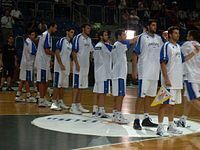 The most successful are Olympiacos, Panathinaikos, and AEK Athens. This page is based on the Wikipedia article Greece; it is used under the Creative Commons Attribution-ShareAlike 3.0 Unported License (CC-BY-SA). You may redistribute it, verbatim or modified, providing that you comply with the terms of the CC-BY-SA.